Directions: Apply to wet hair. Massage into a lather, rinse thoroughly and repeat if desired. Ideal for daily use. Enjoy a fruit-full serving of beaming beauty and vitality. HASK Superfruit Healthy Hair Conditioner infused with Amazonian cupuaçu butter helps provide long-lasting moisture and shine. 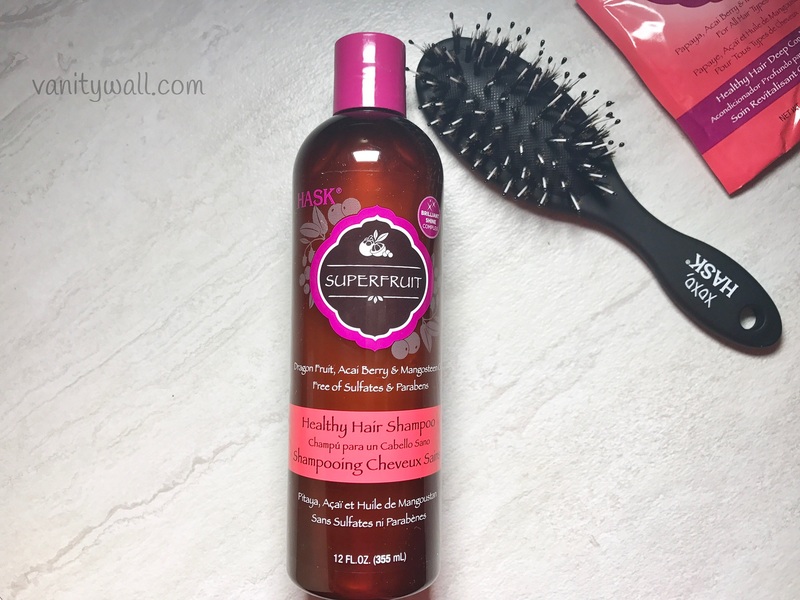 The brilliant glossing powers of mangosteen oil and strengthening properties of the acai berry help to renew and maintain the natural beauty of your hair. Directions: Apply to wet hair. Leave on for 1-2 minutes. Rinse thoroughly. Ideal for daily use. Power up your conditioning potential with this deep conditioner, packed full of nutrient-rich papaya, native to Central America to help smooth and shine hair. The glossing powers of mangosteen oil and strengthening properties of the acai berry help deeply moisturize and revive dry, damaged hair. Now you have the perfect hair conditioning recipe! Directions: Apply a generous amount of deep conditioner to clean, wet hair. Massage into hair focusing on damaged areas. Leave on for 10 minutes. Rinse well. Style as usual. Ideal for use 1-2 times per week, or as needed. Garcinia Mangostana (Mangosteen) Oil, Euterpe Oleracea (Acai) Fruit Extract, Polyquaternium-70*, Dipropylene Glycol*, Panthenol, Dimethiconol, Phenoxyethanol, Sodium Chloride, Polyquaternium-7, Guar Hydroxypropyltrimonium Chloride, Cyclopentasiloxane, Polyquaternium-10, PEG-150 Distearate, Citric Acid, Methylisothiazolinone, Methylchloroisothiazolinone, Fragrance/Parfum (Fragancia), (*Brilliant Shine Complex/Complexe Éclat Brillant). 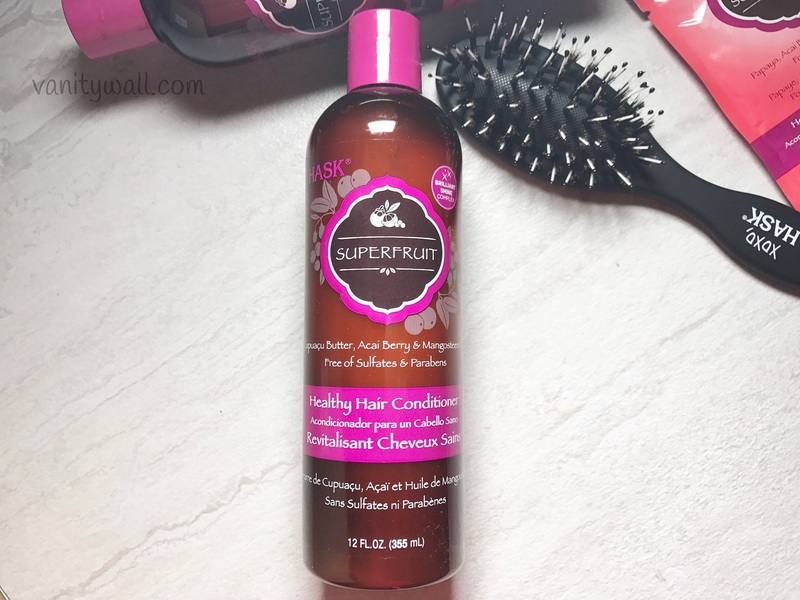 The Hask Superfruit Healthy Hair Shampoo comes in a tinted sturdy plastic bottle. The shampoo has a nice moderately thin texture without being runny that spreads easily onto the scalp and hair. It appears pearlescent white and smells like berries. The entire Hask hair care line is sulphate (SLS) free and just like the Kalahari one this shampoo lathered brilliantly. Just spread it onto wet scalp and hair and work your fingers through it to form lots of lather. It cleans the hair really well without drying it. The formula is excellent and will work for most hair types especially for those with dry and dull hair. This doesn’t specifically say its ok for color treated hair so I stick to using it just once a week for getting soft, shiny and healthy looking hair. The Hask Superfruit Healthy Hair Conditioner comes in a tinted sturdy plastic bottle. The conditioner has a creamy consistency comparatively thinner than the Kalahari one. It spreads easily onto the hair. 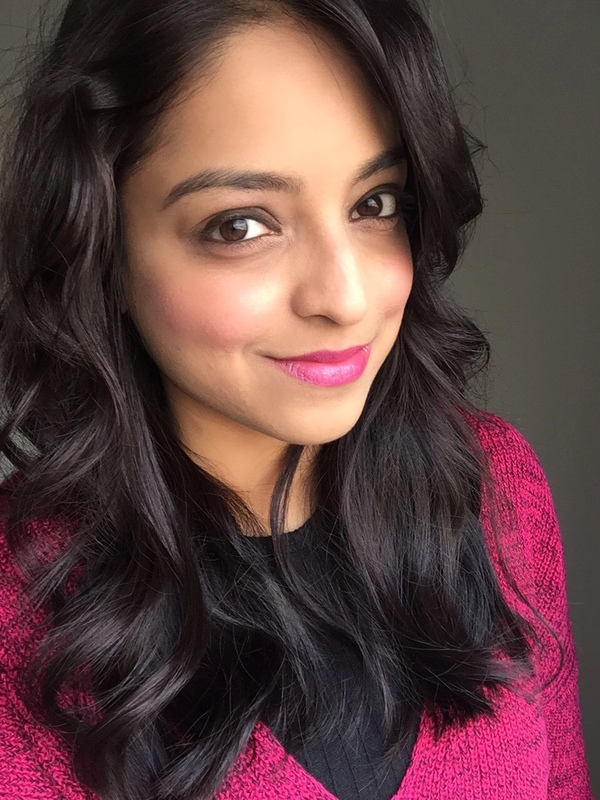 Unlike some conditioners that need bucket loads of water to be cleaned up from the hair, this conditioner works like a breeze. It doesn’t get stuck on the hair and is easy to wash away. Just like the shampoo, this conditioner smells like berries. This conditioner adds ample softness, smoothness and shine and overall hair appears healthy looking. It is extremely moisturizing and can end up being slightly heavy on the hair if you have fine hair like mine. So, my favorite way of using this is to scrunch the hair from the ends. This helps in conditioning the hair from the tips and at the same time doesn’t end up weighing it down. Those with fine hair, should try using it this way. 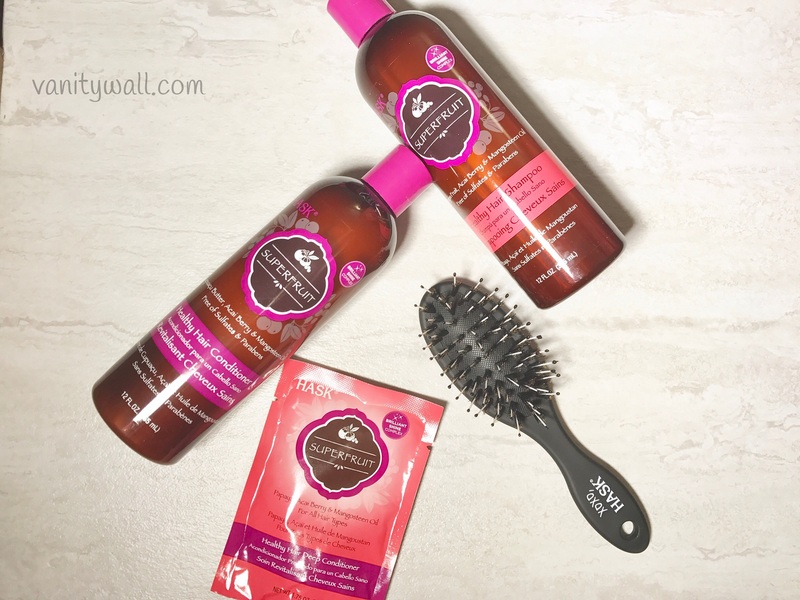 However, for anyone that needs a hydrating shampoo & conditioner duo that is guaranteed to do the job, Hask Superfruit Healthy Hair duo is one of the best options around at such an affordable price. 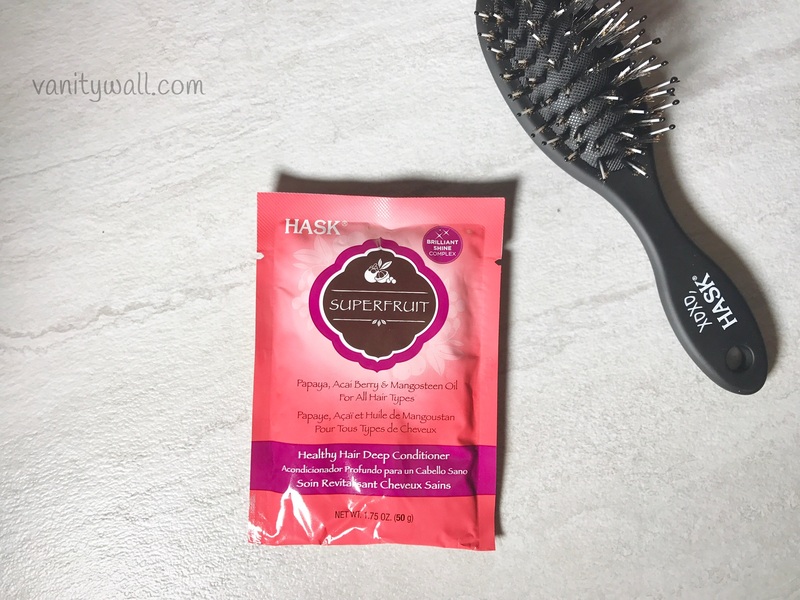 The Hask Superfruit Healthy Hair Deep Conditioner has a very thick creamy consistency. It works well in distributing evenly onto wet hair. Just like the conditioner this is extremely hydrating and can be used as a moisturizing hair mask once a week. It will soften the hair and add ample much shine. Though not recommended for someone with fine hair, this is excellent for dry, damaged or dull hair. Very much recommended for anyone looking for an affordable hydrating shampoo, conditioner duo. 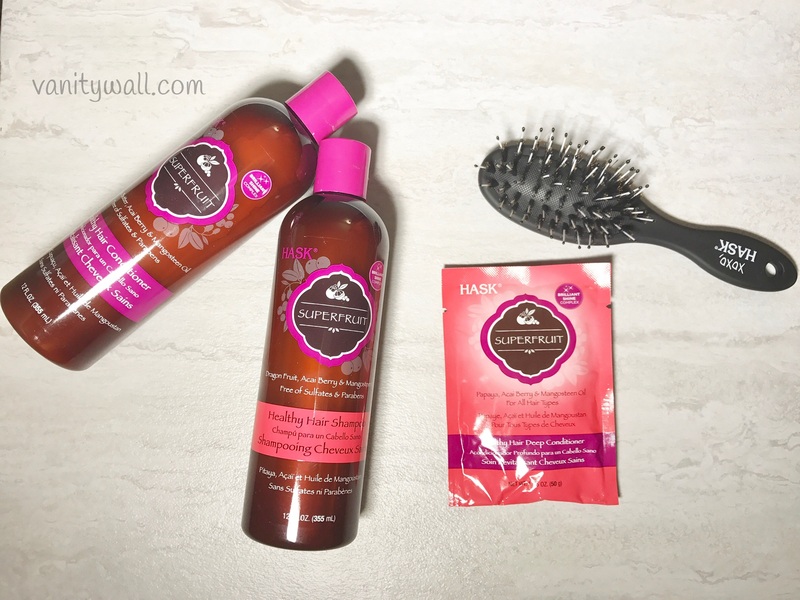 Hask Superfruit Healthy Hair range will revamp dry, damaged, dull looking hair to healthy looking hair with ample softness, shine and smoothness.